Here is just a nice lunch made with local blanched Jersey asparagus and grated hard boiled eggs over greens. Tossed with a lovely lemon vinaigrette and sprinkled with those beautiful chive flowers from my garden. Wish I had some tiny quail eggs, that would've been even prettier. I'll have to work on that. Folks don't realize that NJ is so much more than just Jersey corn and Jersey tomatoes.......we are known for our cranberries & blueberries too, and our lovely Jersey purple asparagus in May! That's why we are called "The Garden State". 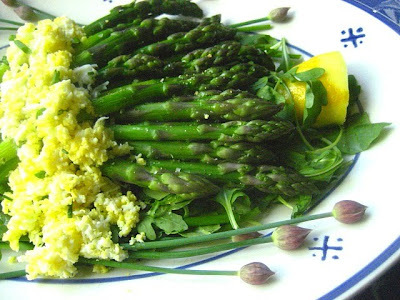 How lucky that you have access to wonderful asparagus. Lovely, but I hear you 'r'. I'm not, never could be, a lady who just does salad at lunch. Need my 3 solid squares. And often the BIGGEST square midday. Is SS still recovering from Eataly? Your homegrown asparagus has been exhausted? A Farmer's Market is a photographer's candy store. 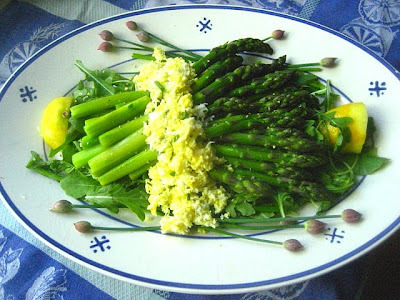 Asparagus is the star of our kitchen when we can find ours, locally grown. Love it raw, for salads, roasted, steamed, sauteed... bring it on. You have that caterer's eye. Beautiful presentation. Lovely! Wish I could get chive flowers to rebloom. Any ideas about that? 65, my chive flowers are just opening now, but it's a once a year thing only. I wish the little buds would stay all year! they are so pretty! 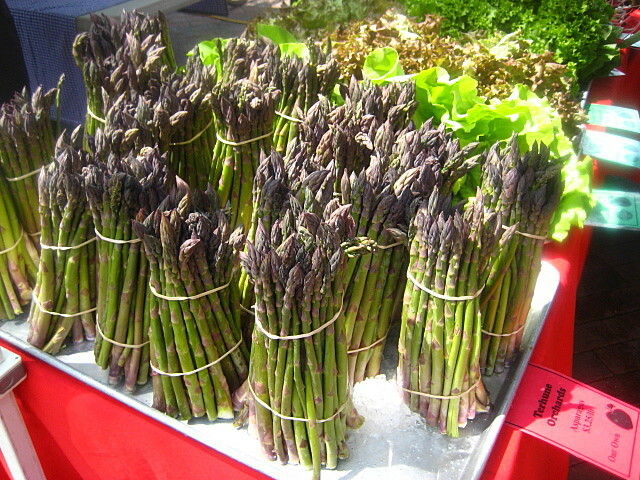 All of our local asparagus over here is from NJ! That looks like one delicious salad...I could eat asparagus by the pound. 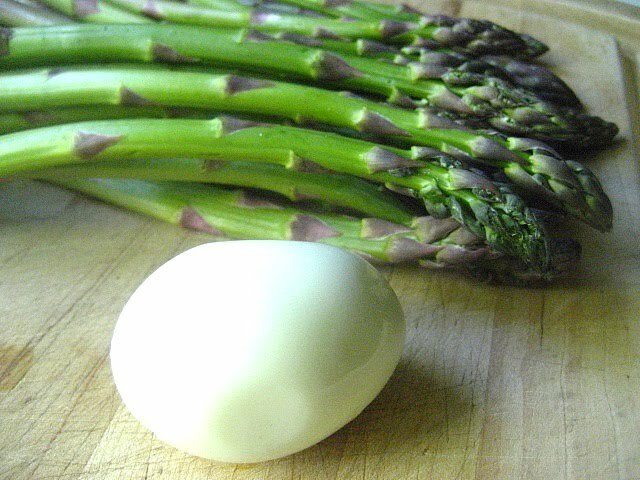 NJ has the best asparagus - we are lucky. That sure is a pretty spring lunch! Beautiful plating Stace, I'm sure it was delicious! I adore fresh asparagus.